Rooibos tea comes from the Cedarberg valleys of South Africa. It is known as Red tea to many because of its unique mahogany red color it takes after fermentation. The Rooibos tea has become very popular due to the spreading of information about its health benefits. It is very rich in antioxidants that help detoxify the body and it does not contain any caffeine like most teas do. Some of the benefits that rooibos tea is known for also include easing nervous tension, allergies and digestive problems. At the Tea Supply you can choose from Rooibos Bigelow Tea, Rooibos Twinings Tea and Rooibos Loose Leaf tea just to name a few. Enjoy our Exotic Chai Rooibos Evoke the beauty of South Africa with our Chai Rooibos tea—a creative twist on traditional chai. We combine Rooibos, a red tea with antioxidant properties, and a traditional Ayurvedic blend of Cardamom, Cinnamon and Clove. Enjoy the spicy warmth of this intriguingly delicious Yogi Chai Rooibos tea any time of day or night. * *These statements have not been evaluated by the FDA. This product is not intended to diagnose, treat, cure, or prevent any disease. A distinctive herbal tea expertly blended using only 100 percent pure rooibos to deliver a flavorful tea with an uplifting aroma and naturally sweet taste. Unfermented "red tea" milder than rooibos with a fresh sweet flavor, antioxidant rich. SUPERFRUIT ENHANCED. Enticing, tantalizing and truly energizing. This rosy blush blend of pu-erh black and green oolong teas merge to create an intoxicating mix of sweet fruit with bright mint. Authentic Rooibos (pronounced roy-boss) or Herbal Red Tea comes only from the Cedarberg Mountains in the remote area of central South Africa. This herbal tea, made from the leaves of the Rooibos plant, has been enjoyed for countless generations by native South Africans. The plant is harvested in summer, fermented and then dried in the sun until it reaches a deep mahogany red color. Rich in antioxidants, and caffeine-free, Twinings African Rooibos Herbal Red Tea has a pleasantly sweet flavor. 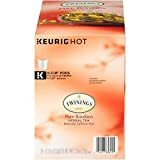 Great to drink with lunch or in the afternoon, this tea is best with a little milk or served plain. African Rooibos is a naturally caffeine free herbal tea with a distinctive reddish color and a pleasantly sweet flavor that naturally contains antioxidants. Rooibos, known as 'Red Bush' in its native South Africa, is a popular herbal beverage. It looks like tea and has healthy properties, yet contains no caffeine. Curious? Try our organic version in convenient box of 20 tea bags. Each tea bag brews a 6 to 8 oz cup of tea. Harney & Sons was founded on a commitment to deliver customers the finest quality tea possible. This promise, made 30 years ago, serves as the company's guiding principle. Today, Harney & Sons Tea remains family owned and managed, with three generations of Harney's preserving John's tradition of fine tea and traveling the world in search of the finest ingredients. It is not only the Harney mission to deliver quality tea products to their customers, but also to educate the world of tea history and taste. Whether through their dedicated customer service team, their published guides to tea drinking, or their two tea tasting shops, the Harney & Sons team works to pass on their passion of tea to a wide audience. From lugging heavy tea filled chests down their basement stairs, to stocking shelves at stores nationwide, Harney & Sons remains committed to delivering their customers a superior tea drinking experience. Madagascar Vanilla Red TeaWhen the king of the animal kingdom has tea, he sips Madagascar Vanilla Red Tea. With its magnificent fragrance and lush taste, this naturally caffeine-free red tea flavored with real Madagascar vanilla bean resonates with the wonders of Africa. South African red tea is prized for its refreshing flavor, hot or iced, and as a source of antioxidants. Wrap yourself around a steaming cup or capture the chill of roaring good refreshment!About the Tea100% NaturalThis product contains all-natural ingredients and flavors, and no artificial colors or preservatives. 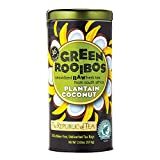 Naturally Caffeine Free.Available in 20 count box.Ingredients: Rooibos, natural French vanilla flavor, and vanilla beanGluten free.Nutrition FactsServing Size: 1 tea bag (2g)Makes: 8 fl. oz.Servings Per Container: 20Amount Per ServingCalories 0% Daily Value*Total Fat 0g0%Sodium 0mg0%Total Carb. 0g0%Sugars 0gProtein 0g* Percent Daily Values are based on a 2,000 calorie diet. Organic Island Breeze Green Rooibos Tea Our Organic Island Breeze Rooibos tea is a sweet and bright tropical blend of Organic South African Green Rooibos, organic mango and papaya pieces, organic orange peel, organic rose petals and natural mango, passionfruit and papaya flavoring. 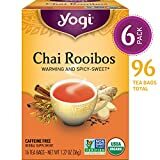 This rooibos tea is wonderful hot or iced and is naturally decaffeinated! Certification: USDA Certified Organic Tasting Notes: Fruity, Floral, Citrus Caffeine Level: Caffeine Free Ingredients: organic green rooibos, organic mango pieces, organic papaya pieces, organic orange peel, organic rose petals, natural mango, passionfruit and papaya flavors Brewing Instructions: Steep 1 to 1.5 tablespoons of loose leaf tea in 8 fluid ounces of 212 degrees F water for 5 minutes. Tea brew time and measurements may vary according to preference and brewing device. Packaging: All tea comes in an airtight, resealable bag to preserve freshness. 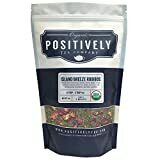 Positively Tea is a USDA Certified Organic tea company specializing in quality, specialty loose leaf teas from around the world. All of our teas are curated with incredible passion and positivity. With over 60 varieties of organic tea to choose from, we offer a positively delicious and organic tea selection to satisfy any tea craving, and superlative for every step of your tea journey. All of our USDA Certified Organic teas are fresh, free of artificial flavors, harsh chemicals and GMOs. Discover the power of tea in its purest form.